This is the second post in a series exploring revitalization in Buffalo, NY. You can read the first post here. This year, People United for Sustainable Housing (PUSH) Buffalo celebrates its tenth anniversary. Its members, through their efforts, are showing the world that they refuse to accept poverty as the status quo in Buffalo, New York. Though the work needed to revive Buffalo’s poorest neighborhoods is great, PUSH Buffalo knows that positive change will continue to happen as has been the case for decades. Despite this perspective, the process is by no means easy. The group’s Communications Director, Lonnie Barlow, pointed that Buffalo like other cities in the so called Rust Belt region of the northern United States struggled when factories and plants closed. The jobs that disappeared during this now decades-long decline never returned. Instead, poverty and violence grew. This is the trend PUSH is working to fight. PUSH counters economic malaise by reclaiming neighborhoods. 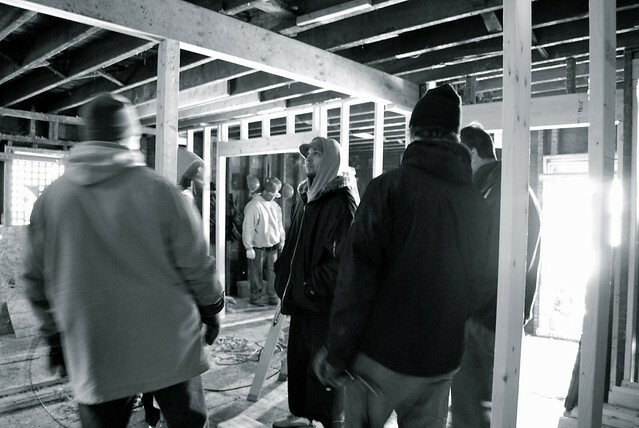 Its 2005 Block by Block Campaign confronted the New York State government, which at the time, was selling abandoned houses in Buffalo to a Manhattan based investment bank focused on creating profits for the wealthy instead of refurbishing the homes. After a protest organized by PUSH at the Buffalo office of Governor George Pataki and the stenciling of his face onto abandoned properties, the situation changed for the better. A new Governor – Eliot Spitzer – gave up government control of around 1500 dilapidated Buffalo properties and created a funding process that is restoring homes in a greener way. PUSH Buffalo, also took advantage of the moment and purchased outright several houses on the West Side of the city, that it then refurbished into livable and affordable rental apartments. What I find most exciting about PUSH Buffalo’s work is that it is deeply local. Members of the community who care about their city, come out and work hard to turn Buffalo into a place that people want to call home. The revitalization being pursued by the organization in turn creates training opportunities and jobs in construction for residents. PUSH Buffalo keeps busy with many different projects because, as an announcement for the January 2015 monthly meeting pointed out, much needs to be done. On any given month the organization might be involved in job training workshops, talks on how Buffalo can produce environmentally friendlier energy, meetings that focus on community development, and other endeavors. People truly are refusing to be defined by Buffalo’s history of deindustrialization and building a new way of life in the city. PUSH forces those in power to value the voices of the poor as much as those of the rich. Post by Piotr Rajchert. Photo Credit: PUSH Buffalo.